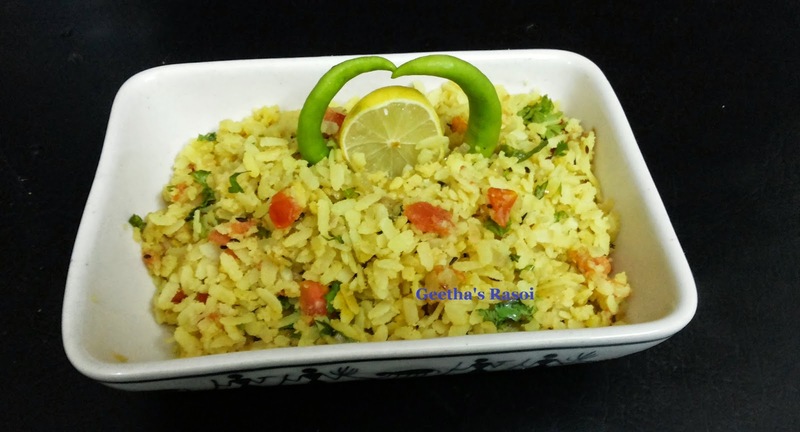 Kanda poha is a popular maharashtrian breakfast recipe. My aunt used to make this for breakfast during my collage days. She used to be prepare with onions and potato. Poha is the Maharashtrian word for flattened or beaten rice and kanda means onions. This is a light breakfast which is easy and quick to prepare. “KKAJ” food group today member’s choice recipe is Jayashri baleri ‘s kanda poha which was a new version for me by adding tomatoes in it. Got tempted to see all the pics who posted there. So I prepared it for dinner tonight. It’s really nice, tangy and spicy poha . We all loved it , thanks to Jayashri for her recipe. Wash and soak poha/avil for 3 to 4 min. Then strain and squeeze out the water and add little salt to poha and keep aside. Heat oil in kadai, add jeera when it crackles add chopped green chilly fry a min then add finely chopped onions fry till it becomes translucent. Then add chopped onion fry for a min, then add turmeric powder, and poha mix well. Lower the flame, cover and cook for 3 to 4 min., then add chopped coriander leaves and squeeze lemon juice as per taste. Mix well and serve hot with tea or coffee.